Small platters serve 10-15 people. Large platters serve 20-25 people. Catering orders must be placed at least 2 days in advance. Choose from Turkey & Provolone; Ham & Swiss; Roast Beef & Cheddar; Tomato, Basil, & Mozzarella; or Vegetable & Hummus. Our deli offers a wide array of salads - from classic potato salad to quinoa tabouli. Selections change seasonally. Choose from Ham & Swiss, Broccoli & Cheddar, Quiche Lorraine, and Artichoke Smoked Mozzarella (each serves 6). Choose from an assortment of our wholesome house-made soups - from vegan and vegetarian to meat and seafood varieties. 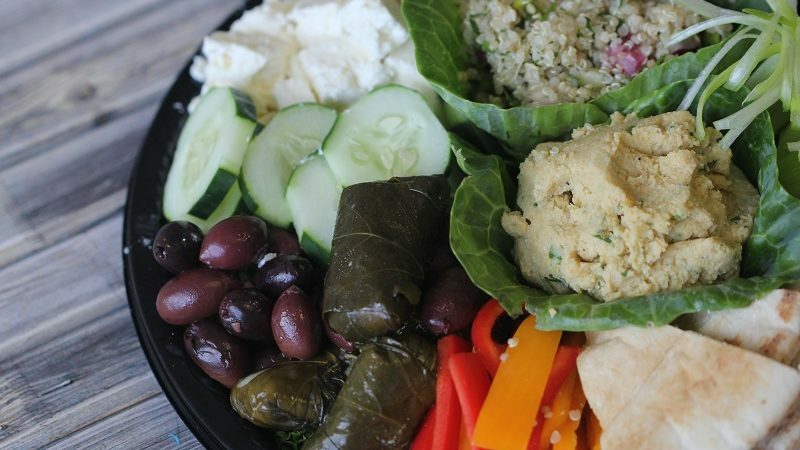 Olives, dolmas, vegetables, feta cheese, and pita served with tabouli and hummus. Our most delicious meat and cheese sandwiches on your choice of fresh bread (mayo and mustard included). Beautiful vegetable and cheese sandwiches on your choice of fresh bread. Choose from Hummus, Vegetable, and Caprese. Local and imported cheeses, including smoked Provolone, Pepper Jack, cheddar, Swiss, and Brie served with grapes. This platter is stacked full of sliced deli meats and cheeses. Great for make-your-own sandwiches or snacks. Carrots, celery, broccoli, tomatoes, and cucumber with a pint of hummus. A selection of ripe seasonal fruit with lemon poppy seed yogurt and dip. Choose from Double Chocolate Brownies, Dream Bars, and Shebas. Choose from full size Chocolate Chip, Peanut Butter, Monster, and Oat-Walnut Zig Zags. Choose from a delicious assortment, including Blueberry, Chocolate Chip, and more. Choose from Carrot Cake with cream cheese frosting or our Vegan Chocolate Cake. Two sizes available, including 8"x8" and 1/2 sheet (serves 24). Choose from seasonal varieties such as Cherry, Apple, Key Lime, French Silk, or Pecan and Pumpkin (only available during the autumn/winter). Fair Trade Peace Coffee available in regular and decaf (serves 12). Choose from Cuke Skywalker, Apple Zinger, Green Lemonade, Apple Mint Beet, or our Build Your Own juice option.